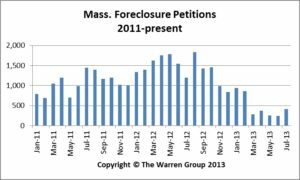 BOSTON, September 10, 2013 – A total of 407 foreclosures were initiated in Massachusetts in July, a 66 percent drop compared to the same month last year, according to The Warren Group, publisher of Banker & Tradesman. 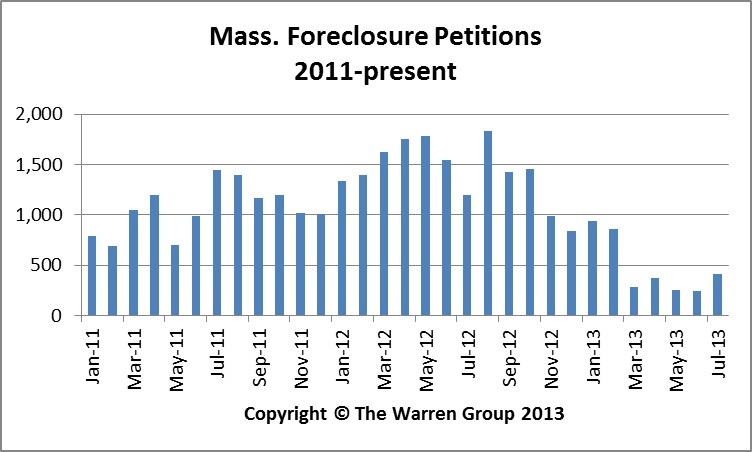 July foreclosure starts were down significantly from the same month last year, when 1,198 petitions were recorded. This marks the ninth consecutive month of declining year-over-year foreclosure petitions. So far this year, 3,350 petitions have been filed, down more than 68 percent from 10,623 during the same period a year ago. Foreclosure deeds also dropped to 298 in July, a 54 percent decrease from 648 in July 2012. This marks the 14th consecutive month of declining completed foreclosures. A total of 1,873 foreclosure deeds have been filed so far this year, a 65 percent drop compared to 5,413 deeds recorded during the same period last year. The number of auction announcements tracked by The Warren Group also decreased in July. Auction announcements declined more than 57 percent to 502 from 1,168 in July 2012. From January through July, 3,070 auctions have been announced, a near 70 percent decline from 9,300 auctions during the same period in 2012.